Infinity Classia review | What Hi-Fi? In a category dominated by British and Scandinavian brands, can US brand Infinity turn out a speaker package to compete? Well, there's certainly plenty of the Classia system to go around. 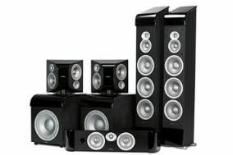 Its 120cm-tall C336 front speakers are partnered by an equally hefty CC225 centre, plus two PSW310W active subwoofers. These unusual designs have 400W of power amplification and three 25cm bass drivers. So far so substantial, and if the C255ES rear speakers are more compact, they compensate with their complexity: they can be configured to run as bipoles, dipoles or conventional monopole speakers to your taste, and even allow you to configure one speaker to fulfil the job of two, with each side of the cabinet operating as each half of a stereo pair. But for all its apparent value, the Infinity is cruelly undone by its sonic limitations. The front speakers lack expression and drive, their midrange appearing too soft-edged and clumsy to convey adequately the drama of The Dark Knight's Batpod chase. True, treble remains largely controlled, but there's a ponderous approach to middle and lower frequencies. That lack of precision is highlighted further by the twin subwoofers: they're boisterous and lusty, yet the leading edges of bass notes are soft and ill-defined. The Classia appeared to have much to offer, but there are far better ways to spend nearly £3000 than this.